Our reputation for designing, fabricating, installing and servicing automated valve systems is unsurpassed, which is why UMC automated systems are operating around the clock in all corners of the globe, serving clients in an array of industries. Valve solutions that do the work for you. Automation has been a core capability at UMC since day one. 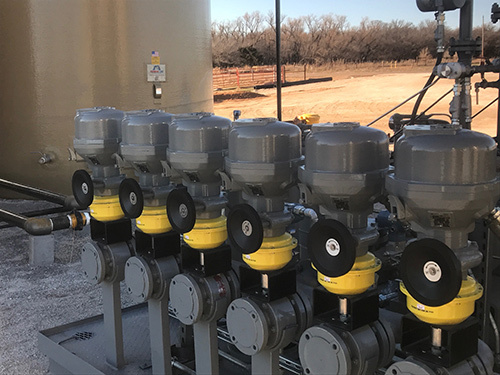 We provide customized valve automation solutions for electric, hydraulic, and pneumatic actuators to meet the most demanding and stringent project requirements. Specializing in valve automation for the Oil & Gas, Petrochemical, Industrial, and Water/Waste Water Industries, let UMC’s strategic partnerships and our own experienced team show you why we have earned a reputation to constantly provide our customers with the most cost-effective solutions for custom-built valve automation packages in the industry. UMC has a large actuator stock allowing for quick turnaround times in virtually any applications, often striving for final delivery to our customer in less than a week, and at times in just hours.